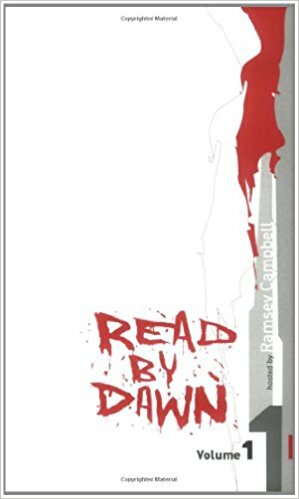 Read by Dawn is an anthology of two poems and twenty-six short stories, one of which, “The Place of Revelation”, is by Ramsey Campbell who ‘hosts’ the anthology and also provides the book’s introduction as well as the endpiece. Read by Dawn is an eclectic mix of stories, some of which I liked very much indeed, some of which bored me to tears, and a few of which I just didn’t understand at all. Of the ones that I did like, the first three that come to mind are “The Woman Who Coughs up Flies” by David Turnbull, “What Betty Saw” by Joel Jacobs, and Ramsey Campbell’s “The Place of Revelation”. “The Woman Who Coughs Up Flies” pulls the reader into the story immediately (this reader anyway) and makes them wonder what has happened to the old woman and why it happened. It is quite a sad story and it was easy for me to feel the old woman’s love when she thought of her grandson. And her pain. As well as being a sad story “The Woman Who Coughs Up Flies” is also a story of betrayal, and of revenge (of sorts). The story starts well and it ends well. It is very good. “What Betty Saw” is a very short story. It is just one and a half pages long and tells of Betty’s uncanny powers and how she uses them. It’s short and sweet with a powerful ending. “The Place of Revelation” is one of the longest stories in the book (none exceed 4,000 words). The central character is a young boy called Colin and he has a story to tell. He tells it to his uncle, when he comes to Colin’s room in the middle of the night, but that is only fair; his uncle has told Colin plenty of stories in the past. £The Place of Revelation” is creepy and mysterious and I am very glad indeed that I don’t have an Uncle like Colin’s. Read by Dawn is 251 pages long, all of the stories/poems are of a dark nature, and with so much to choose from I am sure that most readers should find something they like. I didn’t like all of the stories, but the ones that I did like, I liked enough to make me consider the time I spent reading Read by Dawn to be time well spent.